The Royal Bank of Scotland Headquarters was conceived as a small town, with High Street, squares and neighbourhoods; each ‘business house’ having its own landscaped courtyard. The. The Street acts as the main circulation spine - the social focus for the building - and unlike many ‘street’ buildings, is actually designed to perform as a working street with a number of retail units. There are three main sections of street linked by knuckles, creating changes of direction along a general east-west axis, with the westerly end forming the atrium to the executive wing for the building. The street has large glazed skylights along its main branches and large areas of vertical glazing in the knuckles, providing a sufficient daylight factor to minimise the requirement for additional artificial lighting during daylight hours. The electric lighting to the space is predominantly used to supplement daylight when required during the Winter months. During the Spring and Summer, lighting is provided to shaded areas including the colonnades on the South side of the street. The lighting is integrated with the building fabric as far as possible, minimising visual intrusion in the architecture. To optimise energy use, the lighting is controlled by a combination of daylight sensing and time clock control. This allows the quality of light to be varied at the beginning and end of the working day, creating a dynamic feel on dark mornings and a more relaxed feeling at the end of the day. The control system also has special ‘scenes’ programmed for evening functions and events organised along the street. To provide flexibility for event lighting, the knuckles have theatrical type lighting bars equipped with Source 4 pars that can be adjusted to highlight specific areas as required. Additional drama is brought to the street with cold cathode lighting articulating the edges of the bridges at the knuckles. In the evenings, gobo projectors create foliage patterns around the trees. A combination of tungsten, halogen and metal halide Source 4 profiles are used to give controllability and a subtle colour and pattern variation across the width of the street. The warmer and softer TH is used to light the seating areas, while the crisper metal halide lights are used for paved areas. KSLD also designed the lighting for many other parts of the development including the restaurant, executive offices and boardroom, conference centre, leisure centre and swimming pool, as well as the landscape and historic Gogarburn House. Careful consideration was given to the selection of light source and colour temperature throughout the scheme. The client indicated a desire for a warm colour appearance throughout the building, however this had to be balanced with the natural light and colour imparted by the solar control glazing. After site trials, all the fluorescent lamps were chosen to be 3,500°K to provide a degree of warmth and the cold cathode at 4000°K to provide a crispness to edge detailing. All tungsten halogen lamps, including infrared-coated lamps, are high efficiency types. All are operated between 80% and 95% to optimise lamp life and minimise maintenance. The entire scheme was delivered to programme within a tight budget. In the executive wing, KSLD specified a combination of fluorescent cove lighting and low voltage downlighting to provide a soft open feel. 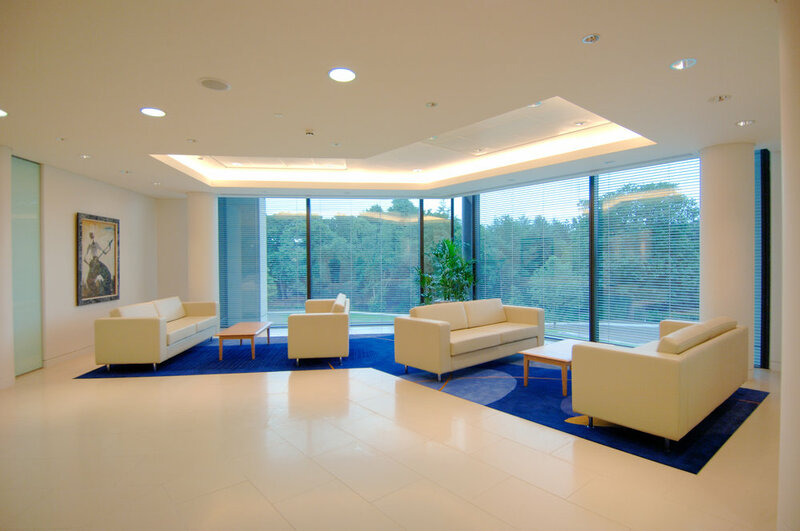 This balanced and replaced daylight from the extensive glazing, punctuated with the low voltage down lights, to accent seating groups and work areas. The same approach was used in meeting rooms, dining rooms and boardrooms with scenes set specifically for video conferencing and screen-based presentations. The Royal Bank of Scotland Headquarters landscape and exterior lighting posed a number of substantial challenges; not least the scale of the site, which extends to 100 acres, encompassing the main building, the conference centre, Gogarburn House, and the RBS Leisure Centre. The site was sensitive, being at the edge of Edinburgh's green belt and adjacent to Edinburgh Airport with consequent restrictions to upward lighting imposed by the CAA and BAA. KSLD’s lighting design approach was a delicate one, creating a number of distinct compositions based around specimen trees and specific landscape features, forming courtyards between the wings of the main building. Overall, we used lamp wattages approximately half that we would normally use in a more urban environment, and took several measures to prevent the visibility of the lighting from the air. We positioned fittings below overhangs and tree canopies, lighting from the inside of the tree canopies, providing glare shielding to every fitting and separately circuiting fittings located in trees shining downwards for pattern effects. Any uplight fittings that may be perceived as problematic could then be switched off without losing the entire landscape scheme. Lamp colours are mainly warm white CDM or compact fluorescent, to achieve the best colour rendering for the varied leaf colours of Autumn, and the fresh Spring greens that predominate when the lighting is most effective between Autumn and Spring equinoxes. The lighting is controlled by a combination of daylight sensors and timeclocks to ensure it operates only when it will be effective and seen, to minimise energy usage. The lighting provides a number of distinct composed vistas, visible from the pathways through the landscape and from the office blocks in the evening. Light trespass is essentially non-existent and the scheme is unobtrusive in the surrounding area, meeting the requirements of both planning authorities and the Civil Aviation Authority. KSLD designed the lighting for the Royal Bank of Scotland Headquarters restaurant, sited at the east end of The Street. Being predominantly a lunch venue, the electric lighting served to provide a balance with the daylight from South facing skylights and windows to the South courtyards. The control system plays an important role in providing flexibility for early morning use in Winter and for evening events.